Highly watchable HDR mode; supports HDR10. Physical Attributes. With the projector on a table, all connectors are on the rear panel, with the power connector and Kensington lock slot near the left side as viewed from behind. The security bar is on the left side, near the front, along with intake vents covering most of the left side. Exhaust vents wrap around the front right corner as viewed from behind, running from the right side of the front to the front of the right side. Low Lamp Mode. Compared with Bright mode, Eco reduces brightness by about 25%. There are also two other power settings. Dynamic works like an auto-iris, adjusting power based on the contents of the current image to make dark scenes darker and bright scenes brighter. Eco+ is a few percent brighter than Eco, although not enough to notice. When the image isn't changing, however, it slowly dims over time by as much as 70% according to Optoma. As soon as the image starts changing again, the projector goes back to the brightest Eco+ level. Presentation Optimized Lumens. For presentations that don't include photos, Presentation mode with default settings is our preferred choice. Colors were a little dark and red shifted, but were still nicely saturated and eye-catching. For presentations with photos, the red shift was more obvious, and tweaking settings for more accurate color dropped brightness dramatically. Using sRGB mode offers significantly more accurate color without needing tweaking, delivering eye-catching color for graphics and acceptably realistic color for photos. Presentation mode's 3,205 lumens can light up a 250-inch diagonal 1.0-gain 16:9 screen in a dark room, or a 165-inch 1.3 gain screen in moderately bright ambient light. For an equally bright image using the sRGB mode's 2918 lumens, the diagonal size is only about 5 inches smaller in both cases. As with most projectors, the brightest mode was green shifted enough to notice without comparing it to a reference image. But if you need the extra brightness, most people will consider Bright mode acceptable, at least for graphics-based presentations. Cinema offers the best color accuracy, with bright, saturated color for vibrant graphics and realistic looking color for photos and video. Game mode is similar to Cinema, but colors are less saturated. DICOM Sim is strictly for medical images like x-rays, and Blending provides a gamma curve meant specifically for edge blending installations that use multiple 4K550ST projectors to create a single large image, as with some museum exhibits for example. Video Optimized Lumens. Cinema mode with some slight tweaking is the obvious choice for optimized SDR video. With default settings, colors were slightly red shifted, but dropping Brilliant Color from the default 10 to 5 delivered acceptably accurate color at 1,642 ANSI lumens. Contrast, Black Level, and SDR Home Theater. Along with realistic color, Cinema mode delivers a darker black level than the best sub-$1,500 1080p home theater projectors. Its contrast is better as well, thanks to both the darker blacks and high peak brightness. Pairing the 4K550ST with a Screen Innovations ALR screen using SI's gray Slate 1.2-gain screen material boosted the contrast even more, making the projector worth considering for home theater in a room with ambient light or for a larger than typical screen size in the dark. The primary limitation in such a setting is the projector's color gamut, specified at 75% of Rec.709, suitable for the high-brightness business applications for which it is intended but short of today's better home theater projectors for either SDR or 4K HDR content. Still, with Brilliant Color set to 5, the measured 1,642 lumens is bright enough to light up a 180-inch 1.0-gain screen in the dark or a 125-inch 1.2-gain screen with typical lighting in a family room at night. With modest tuning, a more powerful but still accurate mode such as sRGB could provide enough light for a 125-inch or possibly larger screen in a well-lit media room, with potential cost savings over similarly bright home theater projectors. As with most recent DLP projectors, the 4K550ST shows few rainbow artifacts, and they are fleeting enough that only those who are particularly sensitive to them are likely to see them at all. HDR. The 4K550ST automatically switches to HDR as the only color mode available when it detects an HDR signal. Five HDR settings offer different levels of overall image brightness. However, the two brightest are nearly identical, and so are the two dimmest, so there are really only three levels to choose from. As with most projectors with multiple HDR settings, the brightest modes are the most watchable and show the most shadow detail. Paired with the SI screen, the 4K550ST delivered a quite watchable 100-inch image in a dark room. But even with ambient light rejection and the screen's boost for both contrast and gain compared with a 1.0-gain white screen, HDR images were a little dark for the lighting we use to replicate a family room at night with lights on. As with most HDR projectors, HDR is best reserved for viewing with the lights off. Zoom Lens Effect on Brightness. The 4K550ST's fixed short-throw lens doesn't offer any optical zoom to potentially affect brightness. Brightness Uniformity. Maintaining uniform brightness across the image is a challenge for short throw lenses, which makes the relatively low 59% brightness uniformity unsurprising. Even so, the uniformity is better than most inexpensive home theater projectors offer, and the variation doesn't show with most images. With a solid white test image, we could see that the bottom was slightly brighter than the top, and the vertical center was brighter than the sides. But with text, graphics, or photorealistic images breaking up the field of view, the difference is too little to notice. Input Lag. Input lag was 51 ms in all modes, which is a little slow for applications like gaming or flight simulators that require quick reaction time. However, it's fast enough for most education-related games. On-board Audio. The stereo audio, with two 5-watt speakers, delivers better audio quality than most projectors offer at high enough volume to easily fill a mid-size room. Fan Noise. 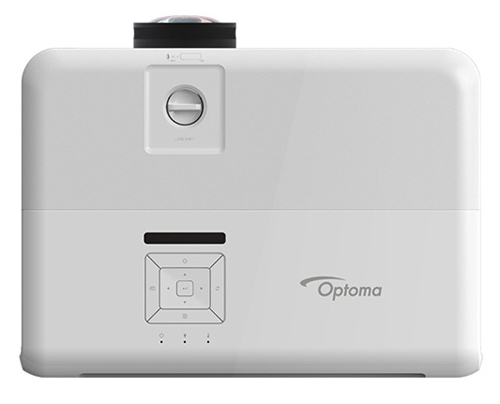 Optoma rates the 4K550ST's noise level at 35 dB in Bright power mode and 32 dB in Eco mode. Both are audible in quiet moments from as far as 15 to 20 feet away, but less so than many projectors in this brightness class. The steady, medium-pitch sound will also tend to fade into the background, particularly in a room with ambient noise. Optoma recommends using High Altitude mode at 5,000 feet and above. Turn it on, and there's less difference between Eco and Bright modes, but even Eco mode with High Altitude on is louder than Bright mode with it off. If you have to use High Altitude mode, consider some sort of acoustic isolation. Throw Distance. The 4K550ST's 0.78 throw ratio translates to an 8 foot 6 inch throw distance for a 150-inch diagonal image at the native 16:9 aspect ratio. The Optoma 4K550ST Projection Calculator will give you the throw distance for the image size you want. Mounting and Lens Shift. The 4K550ST's 13-pound weight and compact size makes it easy to handle during setup. The fixed lens means you need to position it at just the right distance from the screen to avoid having to use digital zoom, which can introduce artifacts and lower brightness. There is no keystone correction (despite buttons for this on the remote, which is shared by other models). This means you also have to position the projector to avoid tilting it up or down for the image to hit the screen. However, there's a small vertical shift that offers some placement flexibility. With the projector on a table and set for maximum shift down, we measured the bottom of the image as even with the lens centerline, which matches the spec. At the maximum shift up, we measured the bottom of the image at 13% of the image height above the lens centerline, which is a little larger than the 10% shift than Optoma claims. The offset and shift is suitable for either a table top or for a ceiling mount with the likely need for an added extension pole. At $3,999, the Optoma 4K550ST is an impressive beast in a compact case. Weighing just 13 pounds and equipped with a short throw lens, it's easy to handle for setup, and it can throw a big picture in a tight space. 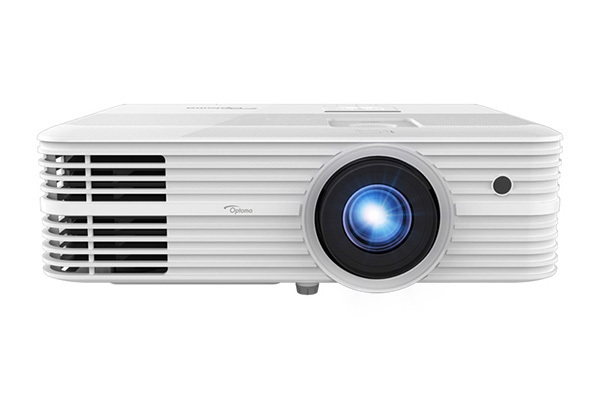 It's also a light cannon, delivering a solid 4,500 ANSI lumens at 3840 x 2160 4K UHD resolution. The combination lets it show images with fine detail at a brightness level suitable for a large conference room or classroom or a small auditorium. At 3,205 lumens with its presentation-optimized settings, the 4K550ST is bright enough to light up a 165-inch 1.3-gain screen at its native 16:9 aspect ratio in moderately bright ambient light. And along with high brightness and resolution, it delivers vibrant color for presentations. For video and film SDR input, the 4K550ST offers realistic looking color and a big image that can stand up to ambient light in a sports bar or a home theater set up in a family room. It can also do a credible job with HDR at image sizes as large as 100 inches in a dark room. The Optoma 4K550ST's performance and mix of features easily makes it a strong contender for a wide range of applications including large rooms and small auditoriums; digital signage, displays, and exhibits; sports bars and even home theaters with ambient light. It even offers a DICOM Sim mode for medical presentations and education as well. 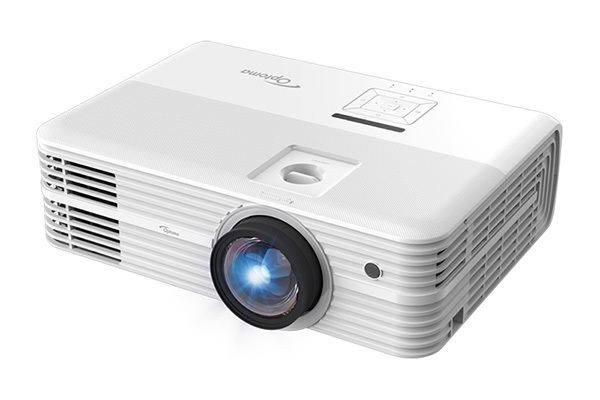 And at $3,999, it is the least expensive 3840 x 2160 short-throw projector in its brightness class, a final touch that makes it a sterling value and helps it earn our Road Test Certified award. It seems little pricey for fixed lens. On plus side, it's pretty bright. Nice. I hope the Optoma ZH506T review is up next. Speaking of upcoming reviews, I'm hoping the NX5/7 is coming soon... and a NX7/X790 comparison. How about a "what's on the test bench" update in the news section? I'm looking for a solid 4k short throw projector for dedicated home theater. Lens to screen is currently 11.5' in my theater and the majority of current 4k projectors don't fill my screen at distance I have to work with. 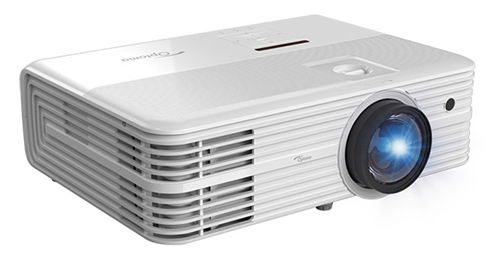 Since this projector seems to be aimed at business/education, yet share the inner parts of the UHD60, would this be a wise choice for a dedicated home theater room with 80% movies and 20% gaming? Thank you kindly for your time/input. Jason, other than the use of the same 0.66-inch DLP chip that's widely used across both the home theater and business projector sectors, this has little in common with the Optoma UHD60. That said, I wouldn't recommend a commercial model like this for installations where the intent is full-time dedicated dark-room viewing. It might be a better fit for a high ambient light theater where its light output is needed for a large screen in a bright room, and where its bulk and/or fan noise won't be a deterrent. If your issue is throw distance, I suggest you use the Feature Search database on our home page. It allows you to plug in your screen size and required throw distance, and refine your search further by resolution or other criteria. See what comes up. If you don't find anything suitable, don't lose heart, as this year should see some new 4K short-throws hit the market. For those unaware, HDR10+ is a Samsung-developed open license form of HDR which provides dynamic metadata that can adjust the picture settings based on scene content rather than simply providing a flag that defaults the display to more generic HDR set-up. There also remains limited content with HDR10+ encoding. I've yet to see a projector that was compliant with HDR10+, and when we do see one, it's likely going to be a dedicated home theater model where the primary intent is dark-room viewing.